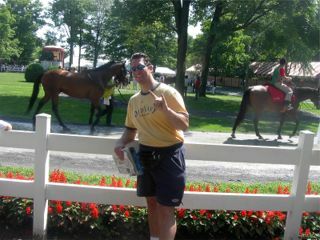 Metal comes to the world famous spa known as Saratoga Race Course. This track rocks. Me and jockey Shawna Barber (dirt and all) at Monmouth Park. Me with the lovely horse trainer Jaclyn Desanctis up at Monmouth Park. A double thumbs up for me and jockey Marcia Stortz up at Monmouth Park. Ferrer up at Monmouth Park.